Real Personal Computing | Personal computing is not about a device, it's a mashup. Drafts 5.4 has been released and it adds WordPress support to Drafts. Previously to post to this site using my iPad I would create and edit the post in Drafts, then send it to Ulysses to publish to WordPress. What I write in Drafts should be sent to WordPress to a Drafts status. The Getting Things Done (GTD) methodology defines a project as anything that requires more than one task to achieve its goal, and it is optimized for projects in which the majority of tasks is completed by oneself rather than delegated to other people. Projects that have tasks completed by multiple people are best managed using a project management methodology rather than GTD. I’ve recently started using NotePlan to manage my todos and I use the Notes section to plan and manage my personal projects. I create a new note using the project name for the title, then I create a bullet list of the project tasks, which is pretty straight forward. What makes NotePlan useful to me for managing these projects is its scheduling and linking capabilities. To set up linking, I went into Preferences and enabled Append Links When Scheduling Todos. When you enable this setting NotePlan appends a link to the source sheet, either Notes or Calendar, to the end of the todo item. You see the link in both the source and destination sheets and you can navigate between the two by tapping the links. The key to this process is to only schedule project tasks from the project Notes sheet. If I complete a task on a certain date, you follow the link to that date and see that it is completed. I have not decided on how I want to handle project tasks that are not completed on a single day. When I determine that I need to continue work on a task on another day I can go to the project note and schedule the task again for the second date. The task will be added to that day’s Calendar sheet and the link to it upgraded on the Notes pages, but the link to the first date is replaced. Consequently, I cannot navigate from the project note to each date on which I worked on a task. Another approach is to create a new task item on the project note sheet for each day on which I work on that task, which means I may have multiple entries for the same task. I think what I am going to do depends on whether I actually work on a task on a given date. If I schedule a task on a date but don’t get to it, I am just going to reschedule it from the project note sheet. However, if I do work on the task, I am going to create new entry for that task to schedule it for the second date. I have a thing for gadget cases and bags, particularly ones made of leather, so not long after I bought the IPad Pro 10.5 I started looking for a case. The case needed to protect the iPad but not add a lot of bulk, be easy to remove, and provide a way to carry the Apple Pencil. A nice to have feature is a built-in stand to prop up the iPad for watching movies and working in landscape. At the time that I was looking few cases met my requirements. What I found was either too bulky, too expensive, or just did not provide a way to attach the Apple Pencil. I bought a leather sleeve on Etsy that has a slot to hold the pencil, but the sleeve has been a little too tight fitting making it hard to remove the iPad. Because the sleeve is made of leather, I expected it to break in over time and loosen up, but that hasn’t happened enough to my liking. One case that caught my eye was the Pad & Quill Oxford, but the 10.5 inch version was not shipping at the time. The Oxford is a portfolio style case that is made from a beautiful sheet of leather and has a very nice loop to hold the Pencil, but has two downsides. One is that it uses a non-stick adhesive to attach the case to the iPad, and while you can remove and re-attach the iPad, it is not something you want to do constantly. Easy to remove, but you might not want to remove frequently. Another downside is that it does add bulk, which you really notice when you fold the cover back behind the iPad. I had been living with the sleeve I bought for several months, but every couple of weeks I would do a search to see if any new cases I might like better were available, and I kept being drawn to the Oxford. Finally, I gave in and ordered the Oxford and it has been attached to my iPad for more than a month and I have yet to remove it. The main way I use the iPad Pro is to write notes throughout my work day using OneNote and the Apple Pencil. Without the case I would position the iPad to the right side of my computer keyboard, in a position that is comfortable for writing. Unfortunately, with the iPad in the Oxford Case I have to fold the cover behind the iPad to maintain the same location, but the iPad is then not flat on my desk making it too wobbly for hand writing. The solution for now is to move the computer keyboard so that I can have the case completely open and the cover not folded behind the iPad so that it lies flat on the desk. The result is like writing on paper that is in a three ring binder, it works but I do have to constantly move the keyboard during the day so that it and the iPad are in a comfortable position in front of me for when I need to use them. I am tolerating having to constantly move the keyboard and iPad because the case looks so nice, and did I mention it is leather? If you don’t use the Pencil and find that you use the iPad in a landscape position more than portrait I think you will find the Oxford to be near perfect. The Oxford does act as a stand in landscape that works well for watching video. When I am in my home office and want to type a lot of text I use the Logitech MK850 keyboard and the Oxford stands up the iPad in a comfortable position in front of the keyboard. When I travel I use the Apple Magic keyboard, which I think is the best mobile keyboard to use with the iPad, in a Canopy case. The Canopy case is designed to hold the iPad, naked, in a position in front of the keyboard, but this does not work when you have the iPad in the Oxford. 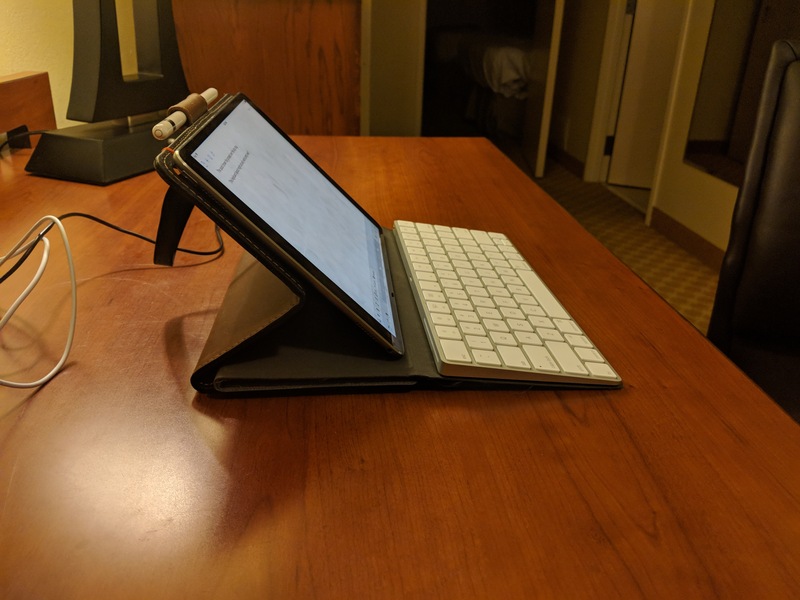 The solution that I have come up with is to collapse the “stand” portion of the Canopy and slide it underneath the iPad as shown in the picture below, and I have found this to be comfortable for typing. If I were to use the iPad Pro for reading lots of text in portrait I would find folding the cover back behind the iPad to be too cumbersome and heavy for long term reading. Fortunately, I have an iPad Mini that I use for almost all of my reading so this has not been a problem for me, but if you only have one iPad and intend to use it to read for long periods of time you might not like the Oxford. 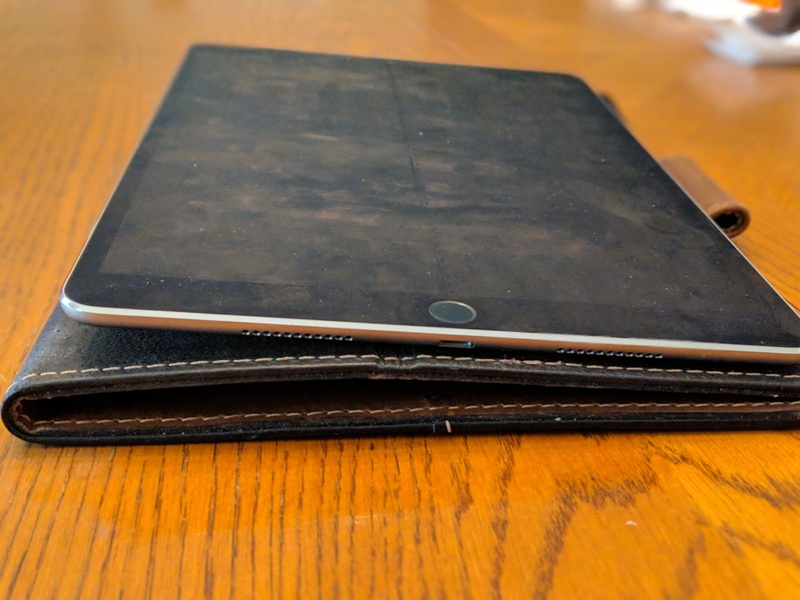 Over time I expect the leather will break in such that the cover lies flatter beneath the iPad, but even then the result might be more bulk than you might like. The result is like holding a hard cover textbook for an extended period of time, you really end up needing to place the iPad on a table or desk. Should you consider the Pad & Quill Oxford case for your iPad? If you find you mostly use your iPad in landscape then I think the Oxford will work well for you, but if you mostly use the iPad in portrait and intend to hold it for long periods of time I think you might want to consider another case. However, if you are like me and really like leather, you might find the appearance and the smell worth tolerating some inconvenience. I have found a way to use the Apple Magic Keyboard with my iPad Pro while it is in the Pad & Quill Oxford case. You can use Google Assistant to remember things but those items are stored in your Google activity timeline and instead I would rather store them in Google Keep. I am guessing Google set it up this way so that it can index what you save for retrieval, but I wish I could save the info in Google Keep. Ideally, the items would be stored with a “Remember” filter so that I could easily review and remove items.